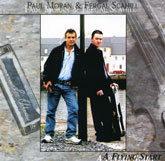 A recording featuring an outstanding harmonica player, Paul Moran, in the company of the equally adept fiddle and guitar player Fergal Scahill. Moran is quite the lilter as well, as his rendition of "Maid of Mount Kisco" demonstrates. The pair of musicians perform a lot of well-known tunes, with a few Cork/Kerry polkas and slides thrown in. A lovely album, and a "flying start" indeed.